He danced into history with his portrayal of Bernardo, leader of the Sharks street gang in the 1961 movie musical West Side Story. The son of Greek immigrants, singer, dancer, and actor George Chakiris was born on September 16, 1934 in Norwood, Ohio, to Steve and Zoe Chakiris. George Chakiris told the Ventura County Star that during his childhood the family moved frequently, until settling in Long Beach, California when he was about 12. The Long Beach St. Luke's Episcopal Church choir, which Chakiris sang in, appeared in the movie Song of Love (1947) starring Katharine Hepburn; he is credited as George Kerris in the movie. After graduating from Woodrow Wilson High School in Long Beach, Chakiris enrolled at the American School of Dance in Hollywood and got a day job to pay for his dance, singing, and drama classes. George Chakiris appeared in 14 movies between 1951-1957, either credited as George Kerris or more often, un-credited, usually as a dancer or chorus boy in musicals. Some of his earliest roles were as a ballroom dancer in the musical comedy Stars and Stripes Forever (1952) with Robert Wagner, and in the musical comedy Give a Girl a Break (1953) starring Debbie Reynolds. He appeared in dance sequences of some of the biggest classic movie musicals in the 1950's, including two movies with Marilyn Monroe - Gentlemen Prefer Blondes (1953), when she sings Diamonds Are a Girl's Best Friend, and There's No Business Like Show Business (1954). George Chakiris was a dancer in two classic movies starring Bing Crosby as well - White Christmas (1954), and The Country Girl (1954); and in two movies with fellow dancer Cyd Charisse - Brigadoon (1954) starring Gene Kelly, and Meet Me in Las Vegas (1956), where he had a slightly larger role as "Young Groom" and is credited as George Kerris. Although still un-credited, George Chakiris broke from his usual dancer role with the World War II drama Under Fire (1957), appearing as Private Steiner. 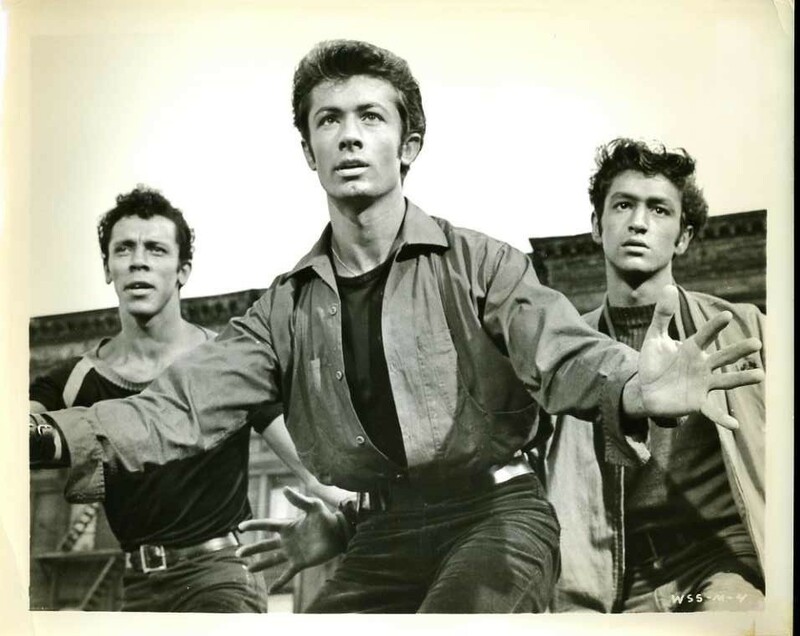 In 1958, George Chakiris was successful in auditioning for the role of Riff, leader of the "Jets" in the London West End production of West Side Story. While appearing on the London stage, he recorded an album of Gershwin music and was invited to audition for the movie version of West Side Story (1961). George Chakiris won the role of Bernardo, leader of the "Sharks" in the movie West Side Story, and co-starring with him was Natalie Wood (Maria), Richard Beymer (Tony), Russ Tamblyn (Riff), and Rita Moreno (Anita). Below, Rita Moreno and George Chakiris in a clip from the musical number America, in West Side Story. West Side Story was a critical and commercial success after it's October 1961 release, and 27-year-old George Chakiris won the Academy Award for Best Supporting Actor for his performance as Bernardo; his dancing partner Rita Moreno won Best Supporting Actress. Below, Bob Hope introduces Shirley Jones, who presents George Chakiris with his Best Supporting Actor at the 1962 Academy Awards - his date, co-star Rita Moreno, gives him a big hug. Chakiris also won a multi-year contract with Paramount, and appeared in 15 feature films during the remainder of the 1960's. He starred in the romantic comedy Two and Two Make Six (1962), and had a co-starring role in the romantic drama Diamond Head (1962) with Charlton Heston, Yvette Mimieux, France Nuyen, James Darren, and Kam Fong (Hawaii Five-O). George Chakiris appeared in two action movies starring Yul Brynner in the early 60's - Kings of the Sun (1963), and Flight from Ashiya (1964). The large ensemble cast of the war drama Is Paris Burning? (1966) included George Chakiris, Jean-Louis Trintignant, Leslie Caron, Alain Delon, Kirk Douglas, and Glenn Ford. 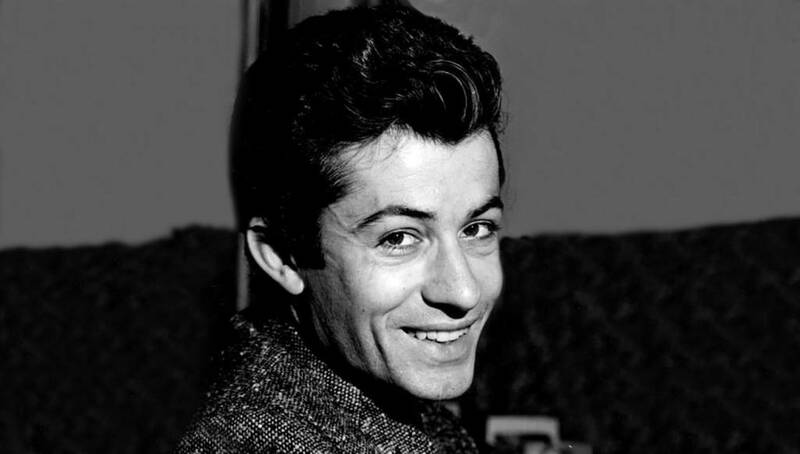 Chakiris had starring roles in the Italian crime drama Bebo's Girl (1964) as the leading man opposite Claudia Cardinale; in the comedy The Mona Lisa Has Been Stolen (1966); and in the war drama 633 Squadron (1964) with Cliff Robertson. By the time he was filming the musical comedy-drama The Young Girls of Rochefort (1967) with Catherine Deneuve and Gene Kelly in France (trailer above), George Chakiris had recorded and released 4 albums under the Capitol Records label. He then discovered that his manager (Ruth Aarons) had cancelled his Capitol Records recording contract without gaining his consent; because he had previously given her power of attorney when she requested it, he had no recourse; something Chakiris has said he deeply regrets. His movie acting career continued through the remainder of the 1960's, and included a co-starring role in the TV musical Kismet (1967) with José Ferrer, Anna Maria Alberghetti, and Barbara Eden. George Chakiris was a popular guest-star on talk and variety shows during the 1960's as well, appearing either in an acting, singing, and/or dancing role on Shindig! (Shindig in Europe), The Andy Williams Show, The Carol Burnett Show, The Ed Sullivan Show, The Tonight Show Starring Johnny Carson, etc. 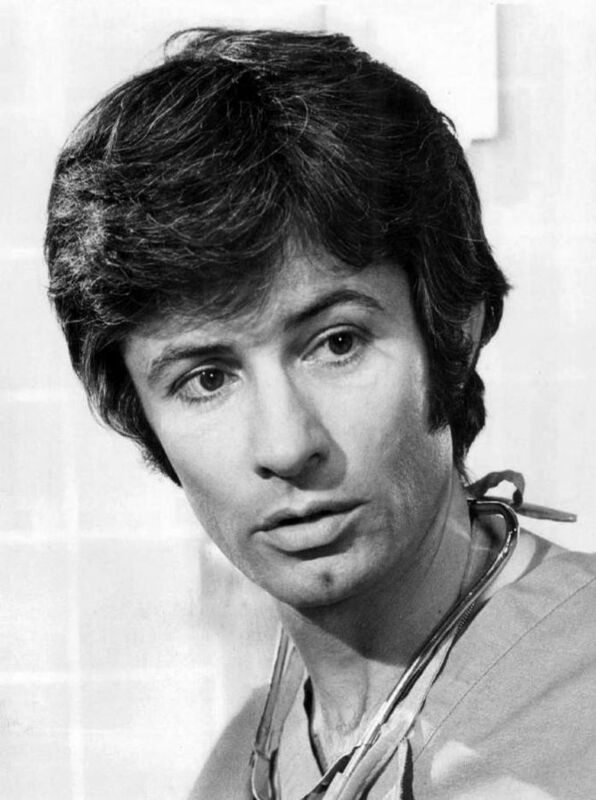 During the 1970's George Chakiris found occasional work on stage (Company, 1971-1972), in Las Vegas night clubs, and in episodes of popular baby boomer television series such as Hawaii Five-O and Medical Center. On the last episode of The Partridge Family, he guest-starred as Captain Chuck Corwin, a former flame of Shirley Partridge (Shirley Jones); and on Wonder Woman starring Lynda Carter, Chakiris was a rich industrialist guarded by Wonder Woman's alter-ego Diana Prince. In the dramatic biographical mini-series Notorious Woman (1974) George Chakiris co-starred as musician Frédéric Chopin opposite Rosemary Harris (Aunt May in 2007's Spider-Man 3). Nicholas on Dallas, starring Larry Hagman, Linda Gray, and Victoria Principal, from 1985-1986. Daniel Espinoza on the daytime soap opera Santa Barbara in 1988 with Jed Allan, Marj Dusay, and Robin Wright. Professor Peterson on Superboy from 1989-1990. In the early 1990's, George Chakiris toured Britain in M. Butterfly playing the role of French diplomat René Gallimard, and starred in the vampire horror movie Pale Blood (1990). He played vampire Michael Fury in Pale Blood. Chakiris co-starred with Lee Meriwether in a production of The King and I in Long Beach, California in 1995, and was in the French mini-series The Girls of Lido (1995) with David Soul. His last film acting role was on an episode of the English sitcom Last of the Summer Wine (1996), although he continued working on stage in Europe. George Chakiris has said in interviews that around 2001, he was early into his senior citizen years and tired of being on the road for 8-10 months at a time and having to leave his Italian greyhound dog Sammy. He began taking classes in jewelry, and his interest in creating handmade sterling silver jewelry became his full-time passion as Chakiris became a septuagenarian. Today his sterling silver jewelry designs "George Chakiris Collections" can be viewed and purchased on his website GeorgeChakiris.com. Chakris, Rita Moreno, and Russ Tamblyn discussed the 50th anniversary of West Side Story live in 2015, below. George Chakiris' break from acting has turned into almost full retirement, although he has given occasional television interviews and appeared in several documentaries. In September 2015, 15 years since last appearing on stage, 81-year-old octogenarian George Chakiris appeared in the cast of the stage musical premiere of In Your Arms at The Old Globe Theater in San Diego, California. Note: This article was first published in 2016 with the title Celebrating Seniors - George Chakiris Turns 82. It has been updated with new & additional content. I met him at a NJ convention in 2018. He was so very nice and still as handsome as ever. My heartthrob since I was 14!! We were just watching West Side Story this afternoon, and I started wondering where they stars were now (aside from Natalie Wood, of course, sadly gone long before her time). Great post. Thank you much! Muchas felicidades, y por muchos años.